Mathewsons are well known and highly regarded within the Classic Car industry. 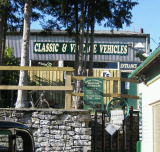 The company has been trading since 1971 and has developed an enviable reputation as one of the most trusted suppliers of Classic Vehicles in the UK. In total including our own Museum, sales showrooms and Auction vehicles we traditionally have around 200 vehicles to call upon. Please note that not all of these vehicles are available to purchase, a number being purely on display for enthusiasts to view. Entry into the Museum remains free for well behaved under 16's and only £2 per adult. Please note children must be accompanied by an adult at all times.